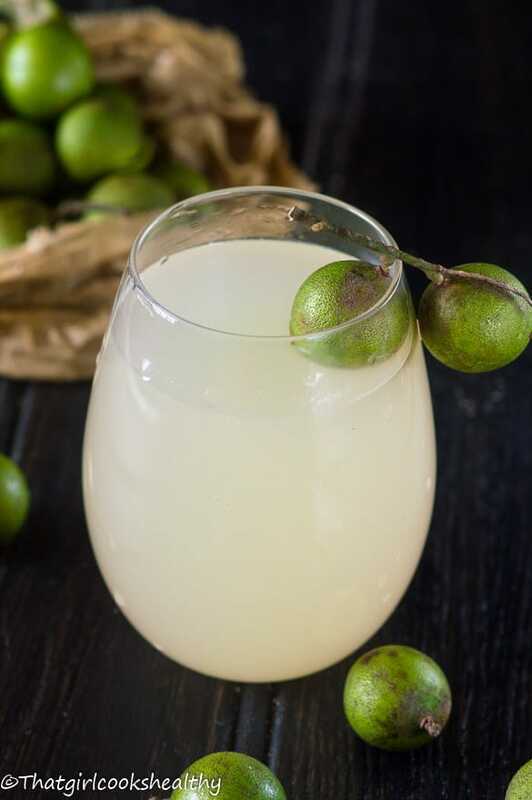 Guinep juice – Quench your thirst with some island style refreshing guinep juice made from the sweet pulp of this tropical fruit. I am soooooo excited to be sharing this delicious, refreshing, tropical guinep juice you with my lovely readers because this fruit is a favourite of mine and it’s healthy too. In case you’re not familiar with this fruit, that’s okay because I will explain in more detail shortly. I know this fruit as guinep I believe Jamaica and the island of Antigua and Barbuda call it the same thing albeit a different spelling. Guineps are relatively small is size, round with a firm, tight green exterior. The interior of the fruit is a creamy colour with a soft pulp surrounding the seed. Despite the lightly coloured pulp, the juice stains dark so do be mindful of this when handling the fruit. The arawak Indian used the juice to dye fabric and cloth centuries ago. What does guinep taste like? I would describe the taste as a cross between a very sweet lime and lychee, almost like a sweet yet hint of tartness to it. They grow widely in the Caribbean, central and America and in certain parts of the United States i.e Florida. What do other Caribbean Islands call this fruit? There are several names for this petite fruit, each name being unique to it’s Island/country. Other such as Trinidad and Tobago, the Bahamas, Virgin Islands, Montserratt, Dominica, Guyana and St Kitts and Nevis call it same thing it’s just a matter of the spelling – chennette, mamon, guinip, and kenep just to name a few. To eat the fruit most people bit into the green skin, tease out the pulp (with seed in tact) and extract the flesh my sucking it inside their mouth. It might sound bizarre but this is the way it is consumed in the Caribbean and considered a social norm. 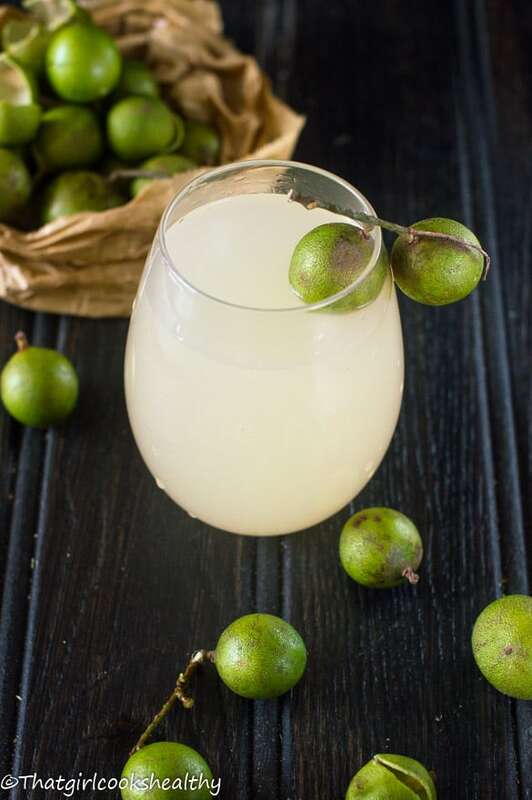 What are the health benefits of making guinep juice? 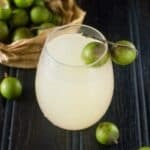 Rather then eat the guinep in its traditional way I wanted to share this amazing recipe that I’m hooked on – guinep juice! It’s incredibly tasty and does require using your hands to extract the flesh/juice. A blender cannot be used because that will pulverise the entire fruit, seed including which will result in a strong bitter taste. You’ll need to soak the fruit in water and use clean hands to separate the pulp from the seed (as much as you can). Don’t worry if the entire thing doesn’t extract as the flavour will still seep into the water. Once that is done,strain the juice and sweeten to taste, that’s it – so simple and very very tasty! If you live outside the Caribbean, guineps tend to be available more during the summer period. Use a paring knife to make a slit in each guinep and remove from their skin. Place the skinless guineps in a large bowl and pour the water onto the fruit. Allow the fruit to soak for 10 minutes so the pulp lifts with ease. Using clean hands start to rub the pulp of each guinep to release. Don’t worry if there’s still some pulp on the seed, the recipe will still work given the volume of guineps used. Strain the juice in a jug then discard the left over seed or alternatively save and consume later. Stir in the desired amount of sweetener, refrigerate and serve with ice. I’ve never heard of this fruit, but you have me intrigued! I’d love to try it! Just made a drink.Beautiful. Thanks again. We make a similar drink on St. Croix – it’s called Billie. 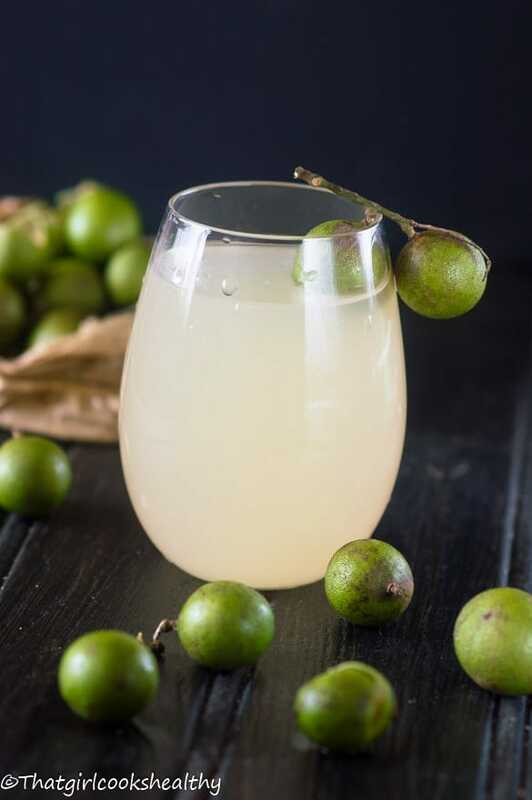 We use Cruzan rum and Geneps – I called my mom for the complete recipe, but she couldn’t remember the third ingredient and it is sometimes left to ferment. I’m thinking sugar. I have never heard of this fruit before. But I am now very intrigued to try it! Thanks for sharing. Thanks Olivia, if you ever visit the tropics, you find it abundantly over there. This looks amazing! I wish I would have tried guineps when I travelled to the carribean a few years ago, they look and sound unique and delicious! Oh no Emily you missed out on the most amazing fruit EVER…. I’ve never heard of this fruit before, but I totally want to try this drink! Looks so thirst-quenching! I’ve never heard of guinep before, but I wonder if I could find some here in the Pacific Northwest. I’m not sure if you could get it over there…it’s worth a try though. We call it chenette in T&T. Always thought it would make a nice juice but couldn’t think of a way to extract that wasn’t ALOT of work. This technique seems like it might work well so I will try it next time I get some. Thank you! I see you didn’t mention in the post that the seeds can also be roasted and eaten. They are yummy too. Our family originates from Puerto Rico, specifically Vieques. It grows abundantly there. We would mix the fruit with sugar and added rum for the adults, a bit of water. You can keep it in the refrigerator for a while. Kept with pulp seed and all. Delicious way to eat it and get a buzz. Lol. Also done in the US Virgin Islands, St.Croix. lots of guinep trees there also. Trees are fruitful during the summer months. Hi Angie. I love learning about the various ways guinep is prepared by different islands so thanks for sharing that information. This beautiful!! Have to try this now that it’s in season.. Thank you for sharing this recipe, I have often wondered if to do it like this but never tried. I have a huge tree in my back yard and wanted to try different things besides chow. Sorry I’m not in the US so I don’t know about the customs in terms of importation of fruit. Try your local Mexican market. Living in NYC all my life, I grew up on quenepas!!!! When summer came around the pariqua man would come out and the homemade coco icy man would too. I would often see pushcarts carrying oranges, grapes, bananas, and yes quenepas. Bodegas would carry them too. I now reside in Florida where predominately not found in many stores. I came across a Dominican store and at that moment I felt like I was at home. Quenepas on the counter, rice and beans and pernil, pollo guisado, etc. Lovecmy cultural upbringing and my culture. Thank you NYC for raising a girl who appreciates you.